The Latino Task Force invites you to an important rally in support of US Senate candidate Kevin de Leòn. De Leòn is up against Democratic Party favorite Dianne Feinstein who is seeking her 6th term. Even though the State Party voted in July to endorse de Leòn there has been little support from them. That is why it is up to us, the progressives, grass roots, and social justice activists to publicly voice our support for a new generation of leadership. It is time for new energy to lead within the Democratic party. De Leòn will be speaking at the September 22 rally and we want to greet him with a large and loud crowd. 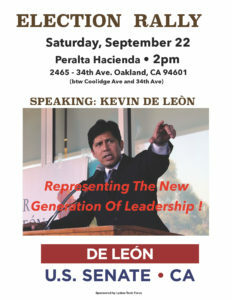 The Rally will take place at the Peralta Hacienda, Oakland, 2 pm (see attached flyers). We are asking that you bring your family and friends, post, advertise and distribute the flyer to your networks. BE PART OF THE NEW GENERATION OF LEADERSHIP! This entry was posted on September 20, 2018 at 1:02 pm. You can follow any responses to this entry through the RSS 2.0 feed. Both comments and pings are currently closed.